FRED easyport is an incredibly small and light pocket defibrillator, equipped with the effective and myocardium-saving defibrillation impulse called Multipulse Biowave. The device fits in every coat pocket and every doctor‘s bag and still meets all requirements of a modern AED. Schiller’s The Art of Diagnostics has always managed to surprise the experts of hetitleh care arena with its innovative range of medical equipment and technologies. The world’s first pocket defibrillator – FRED easyport from Schiller is a Swiss precision masterpiece equipped with all the features you would expect from an average sized defibrillator having size that fits into your pocket. When a patient suffers from a sudden cardiac arrest or dangerous arrhythmia, it is important to re-establish the normal heart rhythm by defibrillating it at the earliest. An automated external defibrillator (AED) makes it possible to deliver an electric shock through the chest to the heart thereby improving the chances of survival. If not treated within minutes, the condition can lead to mortality. Schiller’s small defibrillator weighs only 490 grams and is at a mere 133x126x35mm in size, and still meets all the requirements of a modern AED. 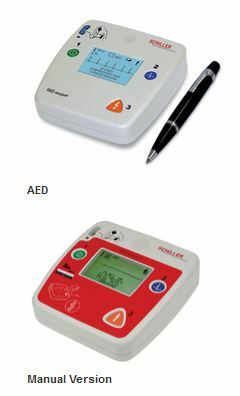 Used for the treatment of ventricular fibrillation and ventricular tachycardia, Schiller AED is powered by a disposable, replaceable lithium battery. Incredibly small size and lightweight features make pocket defibrillator an ideal companion of physicians, paramedics, non-medical personnel and high risk patients thereby granting the victims a better chance of survival. Schiller medical products are distinguished by the use of cutting-edge technology and highest quality standards. Schiller FRED easyport is integrated with the Multipulse Biowave technology that reduces the myocardium damage by a greater extent. Softer electric shock generated through Multipulse Biowave technology causes much fewer ST titleerations in the ECG and triggers significantly less Creatine Kinase (CK) and myoglobine in the blood, thereby increasing the survival rates of ischemic patients. The device has high-resolution LCD screen that displays ECG signals, time, triggered shocks, defibrillation electrode type, operational status and more. Even non-medical people can use the device, as the user will be guided through all operation steps by clear visual and audible instructions. FRED easyport is also equipped with the manual shock option which allows the physician to override the AED mode to decide the defibrillation energy levels and shock delivery.